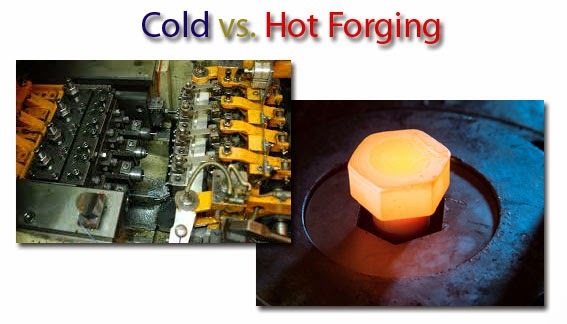 In terms of temperature, there are different types of forging: hot forging, warm forging and cold forging (refer to cold forging vs warm forging vs hot forging). Hot forging is the most popular forging process among these forging types. All the forging technique used in Fly Forge is hot forging, so this article we will introduce hot forging in detail. The main types of hot forging are referred to as open die and closed die forging. In closed die forging, shaped dies are used to convert the initial stock into the finish-forged shape. The term "closed-die" forging is something of a misnomer, as the die cavities are not completely closed and material in the form of flash flows out at the die parting line during the final stages of forging. This flash is a critical part of the forging process, and proper control of the flash is essential to ensure die filling. Within closed-die forging two other terms are used: blocker forgings and precision forgings. Blocker forgings, compared to conventional forgings, have thicker sections and more generous radii. They are termed blocker forgings because the performing shape prior to the finishing impression istraditionally called a blocker. Blocker forgings are easier to form than equivalent conventional forgings, requiring fewer forming stages and lower loads. They are used sometimes when small quantities of parts are required, to reduce die costs, or in difficult-to-form materials, when it is hard to obtain thin sections or there are other problems. Blocker forgings require more subsequent machining to reach the final part shape than conventional forgings. Hot forgings can be produced on a variety of equipment, including mechanical and hydraulic presses, friction screw presses, and hammers. This forging equipment can be divided into two basic types: work-restricted and stroke restricted machines. In work-restricted machines the amount of deformation that can be achieved during each stroke or blow of the machine is limited by the energy or maximum force available. If the energy or force capacity is less than is required to deform the part, then more than one stroke or blow is needed. Machines that fall into this category are hammers, friction screw presses, and hydraulic presses. In stroke-restricted machines the amount of deformation that can be done is fixed by the stroke of the machine. If sufficient force or energy to carry out the operation is not available, then the machine will stall and a larger machine should be used. Mechanical presses fall into this category, as a crank or eccentric determines the amount of ram movement. Hammers are the most common types of machine used, and the basic technology of forging hammers was developed in the last century. The choice of forging equipment depends on a number of factors, including part size and complexity, material, and the quality of the parts to be produced. Hammers are often preferred for small to medium batches because of quicker tool setups and lower overheads. They are also used for elongated and branch-type forgings because die areas can be provided for the larger number of preform dies required for such shapes. Additionally, mechanical presses are not available in very large load capacities, so, for large forgings, hammers or large hydraulic presses must be used. Material costs usually make up around 50% of forging costs, and of this material, a significant proportion is waste material in the form of flash, scale losses, and so on. Die costs represent about 10% of forging costs and the remainder includes direct labor, equipment operating costs and overhead costs. For the purposes of early cost estimating, three main cost elements are considered. Hot Forging vs Cold Forging? Which is better? 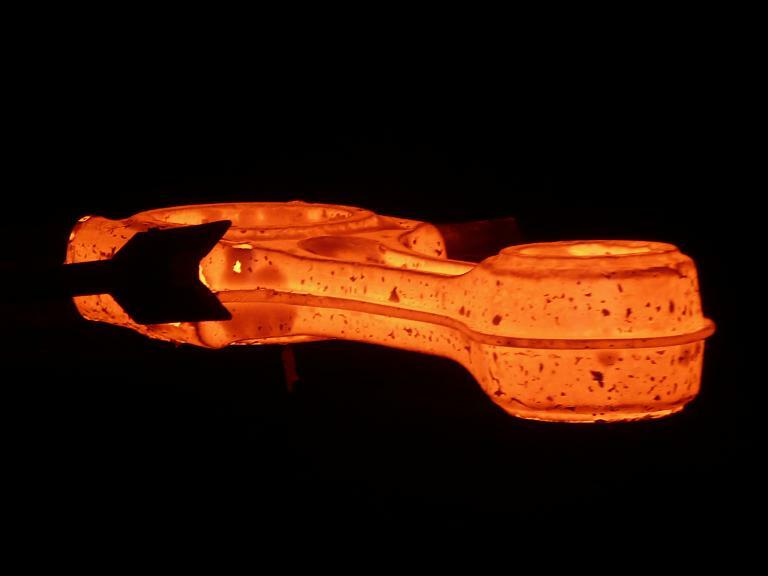 Ideally, hot forging is best suited to metals which possess a high degree of formability (the ability to be deformed without being damaged, which differs depending on the specific metal). However, there are multiple things to consider when determining whether to use hot or cold forging in your metallurgy work. Some of the unique results and considerations involved in hot forging include things like the ability to produce discrete pieces more easily, low to medium accuracy, the formation of scale (a mind of oxidation) on the metal, low metal stress levels and lower work hardening temperature, grain homogenization, higher ductility levels, and the elimination of chemical incongruities in the metal. Cold forging is a bit of a misnomer. It is only “cold” in relationship to the very high degrees used for hot forging. In reality, the temperatures for cold forging are at or near room temperature. While many jewelry metals, including gold, brass, silver, and copper, can be cold forged to produce beautiful and artistic results, most commonly cold-forged items are limited to steel products (like carbon alloy sheets). Interestingly, after cold forging is completed, tempering can be done to strengthen the metal. Like hot forging, cold forging is done by placing the metal into a die, and a hammer will then force the metal into it, causing it to take on the die’s shape. The hammer can either be mechanized or operated manually, and depending on the desired finished product, the hammer can actually be brought down repeatedly in a very rapid sequence. As with hot forging, cold forging offers a number of distinct advantages, weaknesses, and things to consider. Because cold forging is less involved and does not require the same “finishing” processes as hot-forged metals (like spraying on thermal coatings or other things), these aspects can usually be dispensed with entirely and thus can save money. Cold-forged metals are less vulnerable to contaminants and environmental stressors, and often the metals’ surfaces feature a better finish than hot forged products. Additionally, cold forged metals impart directional properties more easily, are improved in interchangeability and reproducibility, and have increased dimensional control. They are also better at handling higher die and stress loads, and can easily produce net-shape parts (or close to them). However, these same things can also be disadvantages to choosing cold metal forging. Moreover, any scale on the metal must be removed before cold forging, and resultant metals are far less ductile than hot forged ones. The process may create residual stress on the metal, and because both more powerful, much heavier equipment and stronger tooling are necessary, some consumers may find that cold forging may create more problems than it solves—or at least is better suited to a more specialized and limited array of both metals and metallurgists. So by comparision, hot forging is more widely used. If you have any hot forging project, pls feel free to contact us.